You have found this opportunity for two reasons: one, you are looking for a way to make money, and two, you believe in recycling and the Salvage Heaven business model. With existing home sales reaching record numbers and the DIY market’s triple digit growth over the last decade, the business of selling recycled building materials is positioned for record growth. And as more baby boomers and millennials become aware and committed to recycling in the U.S. and more education becomes available through the public and private sectors, the potential of growth in this business will follow. Home ownership is at a record high 67%, and these homeowners are spending at impressive rates. Nearly a million homes a year now receive major improvements – consumers spent more than $161 billion on remodeling in 2016, a 23% increase over the figure five years earlier. One need only look at the proliferation of home centers, home goods, and hardware retailers to understand the opportunities this presents. 22 million households move each year. New movers spend 20 times more than the average consumer on goods and services. Home renovating and improvement is the highest budget priority after the move. New movers build new retail and service relationships within the first few months after the move. The typical new mover spends an average of $9,000 in the 3 months surrounding the move. New movers spend in total $40 billion in the first year after their move to furnish, decorate and improve their homes. Salvage Heaven, Inc. is a unique business in that it offers a business opportunity in a booming market across the country with the brand strength of a larger operation. Although owned and operated independently, each Salvage Heaven store, through licensing, builds on the strength of the others with the sharing of information, techniques, markets, and recognition. The license to use Salvage Heaven, Inc. name and trademarks in store signage, advertisements, letterhead, and uniform. An in-depth market database with sources and contacts for materials in demand. A business plan laying out the basics to get started and what to look (and look out) for. The Salvage Heaven newsletter providing on-going tips & tricks, success stories, and database updates. Customized ad slicks for newspaper, magazine, and yellow pages advertising. Utilize the proven method of obtaining, removing, and reselling recycled building materials. A starter kit of every hand and power tool (125 tools) needed for the removal of materials and items from buildings. A visit from Tim Hansen, president of Salvage Heaven, Inc. to your location for 10 days to help set up and run your business. 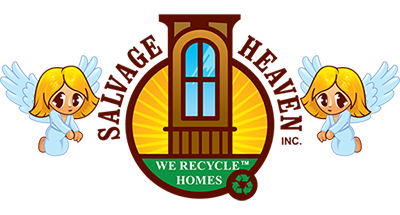 *The licensing of the naming rights and methods of recycling materials from Salvage Heaven, Inc., also protects proprietary information and methods of recycling from employees, contractors, and competition. Most metropolitan areas do not cover the range of products and services we offer. And most businesses are not as recession proof as Salvage Heaven, Inc. Time is of the essence to start in this emerging market offering. Salvage Heaven has noticed many more firms getting into the business but all are “mom and pop” type of businesses operating locally without the research, databases or offering that Salvage Heaven possesses. Our goal is to help open two stores in every large city, the proposed stores would total three in areas with 600,000 to 1m in population. This would allow us to create a network that would buy, sell and trade materials. A distribution system would also be established to inter-connect regions with buyers & sellers top transport the materials. This research has been completed & the selection process is the remaining assignment once multiple stores open. To inquire about owning your own Salvage Heaven store.